There are 52 Assisted Living Facilities in the Brooklyn area, with 21 in Brooklyn and 31 nearby. The average cost of assisted living in Brooklyn is $2,838 per month. This is lower than the national median of $3,346. To help you with your search, browse the 289 reviews below for assisted living facilities in Brooklyn. On average, consumers rate assisted living in Brooklyn 3.9 out of 5 stars. Better rated regions include New York with an average rating of 3.9 out of 5 stars. Caring.com has helped 19 families in Brooklyn find high-quality senior care. To speak with one of our Family Advisors about assisted living options and costs in Brooklyn, call (855) 863-8283. Brooklyn, New York, is one of the five boroughs of New York City and is located along the coast of New York. Brooklyn is a melting pot, and there are significant communities of Irish, Italian, Greek, Jewish and Muslim Americans. Seniors who identify with one of these cultural identities might find established ethnic and linguistic security within Brooklyn. Brooklyn has the largest population of the five boroughs with nearly 360,000 citizens over the age of 65. This substantial group is serviced by over 60 assisted living facilities (known as adult care facilities, or ACFs, in New York) located in Brooklyn and the surrounding regions. 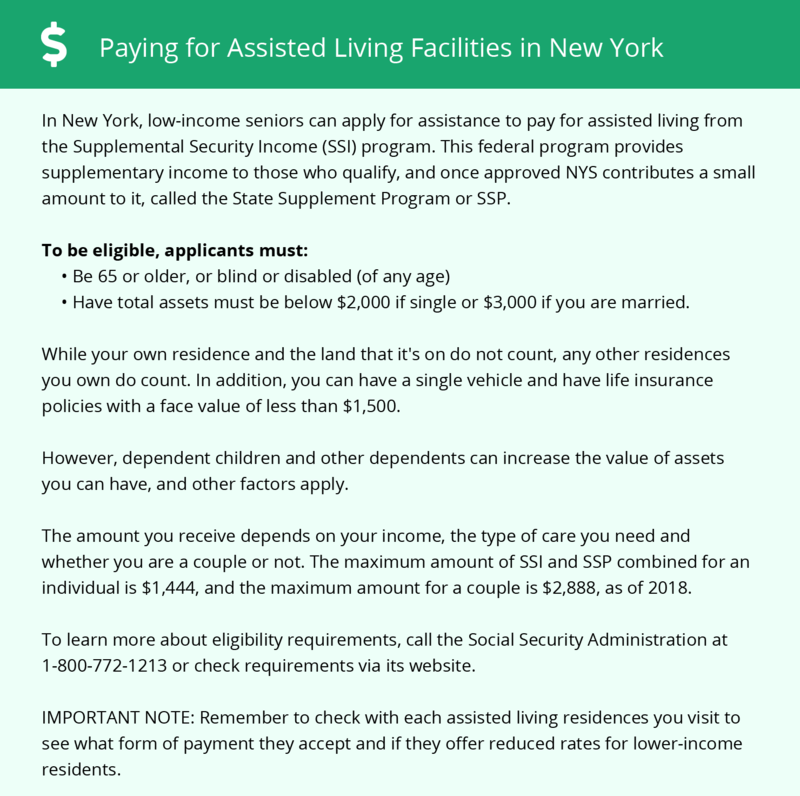 ACFs are regulated and licensed by the New York State Department of Health and provide long-term residential services to adults who can no longer live independently. The Brooklyn area is home to world-class medical facilities, including the New York-Presbyterian Brooklyn Methodist Hospital, Brookdale University Hospital and Medical Center and Calvary Hospital, in the event of medical emergencies or illness. Brooklyn has an array of community resources for seniors and is home to 12 senior centers. One such center is the Dorchester Senior Citizens Center, Inc., which provides social and educational activities, such as aerobics, parties and ESL classes. Like the rest of New York City, Brooklyn has public transportation available via the nineteen subway lines, as well as daily express bus service to Manhattan. Seniors enjoy a half-fare discount on all New York Subway fares and bus ticket prices. The Brooklyn area experiences warm and humid summers and cold, windy winters. Because the temperature rarely hits above 90 degrees Fahrenheit, seniors who enjoy extremely hot weather or who don't like being outside in frigid climates should consider looking for an ACF somewhere other than Brooklyn. The chances of being a crime victim in Brooklyn is about one in 55; crime rates here are approximately 81 percent higher than in cities in the rest of the state. Seniors who enjoy traveling independently and who plan to spend a lot of time outside of their ACF should note the crime rates in Brooklyn. Brooklyn offers seniors a vibrant arts culture with the Brooklyn Museum, Brooklyn Philharmonic and the Brooklyn Academy of Music. The Brooklyn Academy of Music provides seniors with discounted membership as well as last-minute ticket deals. Assisted Living costs in Brooklyn start around $2,838 per month on average, while the nationwide average cost of assisted living is $4,000 per month, according to the latest figures from Genworth’s Cost of Care Survey. It’s important to note that assisted living rates in Brooklyn and the surrounding suburbs can vary widely based on factors such as location, the level of care needed, apartment size and the types of amenities offered at each community. In Brooklyn, seniors seeking financial aid to pay for assisted living in New York could consider Medicaid's Assisted Living Program (ALP) waiver, though this opportunity is limited to 4,200 applicants. To see a list of free assisted living resources in Brooklyn, please visit our Assisted Living in New York page. Brooklyn-area assisted living communities must adhere to the comprehensive set of state laws and regulations that all assisted living communities in New York are required to follow. Visit our Assisted Living in New York page for more information about these laws.